God made hard shell nuts and God made soft shell nuts. The Get Crackin' nutcracker made cracking them all equal. Get Crackin' has a simple nutcracker design that offers big results. This heavy duty yet light weight nutcracker makes cracking and shelling any nut child's play no matter how big or small, hard or soft shell. 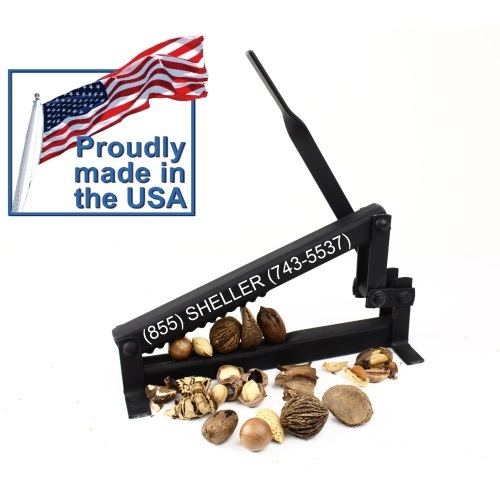 Simply place your Black Walnut in the groove, pull the lever down, and let your Get Crackin' nutcracker do all the work cracking even the hardest shelled nuts. The Get Crackin' lever-fulcrum action allows precision pressure controls which minimizes shell shatter and increases the larger amounts of nutmeat you can enjoy from your walnut trees. The whole family can enjoy this lightweight nutcracker and help out when it is time to gather all the nuts from your trees and "Get Crackin' ". The Get Crackin' is not only simple to use, but is safe for little fingers as well. Designed to handle even the smallest of nuts, like hazelnuts and chestnuts, but it will not 'crack' little fingers if they end up in the cracker without a nut. The same design that protects those small nuts from shattering, also protects little fingers will they help out as they are eager to enjoy that healthy nutmeat. So gather the family around to get in on the nut cracking action. How many times have you used nutpicks or diagonal pliers to get out the tiniest and most aggravating pieces of nutmeat? That is so frustrating! You can also put away all those nutpicks and diagonal pliers because you will not have to fight to get out your precious nutmeat. A quick pull of the nutcracker lever, then simply peel away the shell and if it happens to need more of a crack, slip it right back under the Get Crackin' a little closer to the small side. A gentle tug should free all of your well deserved nutmeat.